IF enough food is to be made available to the poor at affordable prices, the government will have to extend the anti-inflation battle to many fronts. It is not enough to ban the export of wheat and rice and cut duties to encourage the import of food items. It is also not enough to take monetary measures to tighten liquidity. HAVING organised its first Lok Adalat and settled 25 cases on May 3, the Supreme Court has proved how the Lok Adalat system can speed up cases and provide relief to the litigants. Chief Justice K.G. Balakrishnan has advised the high courts and subordinate courts to organise Lok Adalats more frequently. At present, the regular judicial courts are bogged down by many problems. THE summer months of April, May and June are terrible for forests because of the dreaded fires that visit them year after year. This year, the situation has been worse than usual, what with thousands of acres of agricultural land catching fire in Bathinda and Muktsar districts of Punjab, along with Sirsa district of Haryana. AN unusual aspect of the run-up to the Karnataka assembly elections is the role of the BJP leader, Mr L.K. Advani. Admittedly, the party’s experience in sharing power with the Janata Dal (S) was unhappy — a betrayal, in the BJP lexicon. HAVING cleared the written examination for the IAS and Allied Services, I was to appear for the final interview at the UPSC in February, 1962. However, since we had been uprooted from Lahore during the holocaust of partition, my family could ill afford formal instruction at the few elitist coaching centres that existed those days. WITH the Pakistan government giving another reprieve to Sarabjit Singh, till further orders, a glimmer of hope has dawned for all those who have always felt that Sarabjit has been made the victim of cruel circumstances and warped destiny, beyond anyone’s control. MOSCOW – On Wednesday, Dmitry Medvedev will walk through three gilded halls in the Grand Kremlin Palace to a rostrum where he will be sworn in as Russia’s third president, his right hand on a copy of the Russian constitution. Although rising prices of essential commodities has kept finance minister P. Chidambaram on his toes, the minister still managed to take time off to watch the IPL match held in the Capital last week. IF enough food is to be made available to the poor at affordable prices, the government will have to extend the anti-inflation battle to many fronts. It is not enough to ban the export of wheat and rice and cut duties to encourage the import of food items. It is also not enough to take monetary measures to tighten liquidity. The government has been hesitant in extending the ban on futures trading to commodities like sugar, edible oils and other food items. Finance Minister P. Chidambaram wants Parliament to make such a demand. The Leftist parties have already called for a ban since futures trading, they feel, contributes to a rise in the prices of essential commodities. Perhaps, Mr Chidambaram wants the BJP too to endorse the demand. A committee formed by the UPA government under economist Abhijit Sen has found no conclusive evidence to suggest that futures trading contributed to a rise in prices of staple foods. However, it has favoured the continuance of the ban on futures trading in wheat and rice. Besides, the Public Accounts Committee of Parliament headed by MP Vijay Kumar Malhotra has also come out in favour of a ban on futures trading in essential commodities. In fact, the committee has made wide-ranging suggestions to improve the management of foodgrains in the country. The whole system of foodgrain procurement, storage, transportation and distribution requires to be overhauled to cut wastage, pilferage and various malpractices. Post-harvest crop losses are officially estimated at a staggering Rs 55,000 crore annually. The committee has also found fault with the functioning of the public distribution system. The diversion of subsidised foodgrains, meant for distribution among the poor through the PDS, is well known. The parliamentary panel has held the vigilance division of the Food Corporation of India and the Vigilance Committee responsible for the malpractices. There is obviously need for streamlining the delivery mechanism and making it transparent through the use of information technology. HAVING organised its first Lok Adalat and settled 25 cases on May 3, the Supreme Court has proved how the Lok Adalat system can speed up cases and provide relief to the litigants. Chief Justice K.G. Balakrishnan has advised the high courts and subordinate courts to organise Lok Adalats more frequently. At present, the regular judicial courts are bogged down by many problems. These include inadequate number of judges, the high cost involved in prosecuting or defending a case due to heavy court fee and advocate’s fee and inordinate delay in the disposal of cases resulting in huge backlog in all the courts. The track record of the Lok Adalats in the past two decades suggests that these have helped the people, especially the poor, and reduced the courts’ burden to some extent. The benefits of Lok Adalats are many. One, there is no court fee and even if a case is already filed in the regular court, the fee paid will be refunded if the dispute is settled at the Lok Adalat. Two, there is no strict application of the procedural laws and the Evidence Act while assessing the merits of the claim. The parties, though represented by their advocates, can interact with the Lok Adalat judge(s) directly and explain their stand. This is not possible in a regular court. Three, disputes can be brought before the Lok Adalat directly, instead of going to a regular court first. Finally, the Lok Adalat’s ruling is binding on all the parties and there is no appeal to a higher forum. An important advantage of the Lok Adalat is that decisions are usually arrived at by the consent of all the parties involved in a dispute. At a time when people have been craving for speedy dispensation of justice, cases relating to matrimonial disputes, accident compensation claims and labour matters and similar other cases can be speedily resolved in this way. Clearly, if the parties to a dispute are apprised of the legal position, they may agree to settle it amicably at the Lok Adalat itself. Consequently, spreading legal awareness, especially in rural areas, holds the key to speedy justice. THE summer months of April, May and June are terrible for forests because of the dreaded fires that visit them year after year. This year, the situation has been worse than usual, what with thousands of acres of agricultural land catching fire in Bathinda and Muktsar districts of Punjab, along with Sirsa district of Haryana. Four persons have been killed, many injured and crop and property worth lakhs destroyed. All this because some farmers carelessly set fire to wheat stubs to clear the fields. The fire spread and the strong winds turned them into a conflagration. It is providential that many of the residential areas were not engulfed otherwise the toll would have been much higher. What the horrifying incident has brought out loud and clear is that the rural areas are just not equipped to handle such emergencies. Firefighting equipment is virtually non-existent at most places. Government machinery is too haphazard to take coordinated action. It is mostly the common citizens who have to fend for themselves. One weakness that is noticed is the lack of traditional water bodies which could have been used to douse the flames. There is need to sensitise every section to the grave threat that stares them in the eye. Whether it is the fires in the fields or the forests, the root cause is always negligence. One spark can play havoc during these days when there is heavy accumulation of dry materials due to the hot weather. Last few days have seen the outbreak of major fires in the forest areas of Kasauli, Morni and Hoshiarpur. A scientific plan has to be evolved to at least contain, if not totally extinguish, such fires in the shortest possible time. The loss they cause to the bio-diversity, flora and fauna is too widespread to be quantified in financial terms. A little rain on Sunday and Monday helped check the fires but one cannot expect Nature to intervene time and again. The story “Ten human skulls found in Mandi fort” on May 5 had some mistakes. First, it was wrong to say that “Ishwari Sen built the fort in 1625 AD at an accessible place”. It should have been “inaccessible place”. Secondly, the name of the General of Maharaja Ranjit Singh should have been Ventura. In the news item titled “No confirmation on Sarabjit's plea” (page 9, May 4) Mr Anand Sharma should have been described as Minister of State for External Affairs. The April 30 report on the RBI hike in cash reserve ratio should have used the word “curb” in place of “quash” in the headline. The headline of the first edit on April 29 should have been “Just Deserts”. The business page of April 29 had a news-item that Reliance Communication would launch GSM-based nationwide mobile services by the end of the current financial year. The headline wrongly said “RCom’s GSM service by December”. The last few lines were missing in the page 15 story about the gas pipeline on April 29. 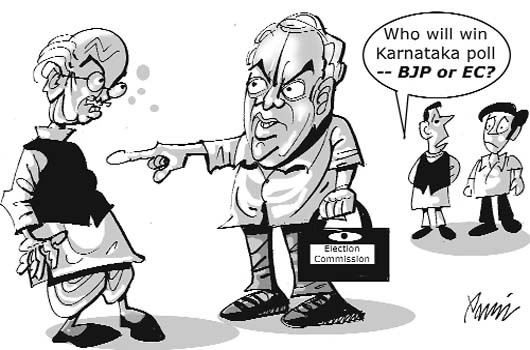 AN unusual aspect of the run-up to the Karnataka assembly elections is the role of the BJP leader, Mr L.K. Advani. Admittedly, the party’s experience in sharing power with the Janata Dal (S) was unhappy — a betrayal, in the BJP lexicon. But while the former Prime Minister and regional leader, Mr Deve Gowda, is desperately seeking to distance himself and his son from their marriage of convenience with the purported communal party, Mr Advani is singing a different tune. In an extraordinary statement, Mr Advani has ruled out an alliance with the Janata Dal (S) in a hung assembly. The Bharatiya Janata Party, he said, would rather sit on the Opposition benches if it did not secure a majority. It is surprising that he should say so, given the prediction of one Gallup poll forecasting a Congress victory. Has Mr Advani then reconciled himself to a BJP defeat? Indeed, the impression is inescapable that Mr Advani’s main objective in campaigning for his party in Karnataka is to refurbish his credentials as the future Prime Minister, rather than advance the BJP cause within the confines of Karnataka. He has donned the mantle of the statesman, a man of principle who weighs his words and is more interested in serving the country, rather than his person or party. Interestingly, Mr Advani is sincere in believing that he is the best man for the job of Prime Minister. The problem is the disparity between this self-belief and the wider perception of a man steeped in the philosophy of the Rashtriya Swayamsewak Sangh, the man who spouted blood-curdling rhetoric in his infamous rath yatra, painting the countryside red, triggering in the process the chain of events that brought the BJP to power in New Delhi for the first time ever. Mr Advani’s mentor, Mr A.B. Vajpayee, was also an RSS worker, but he had sedulously cultivated a liberal persona and his mastery of words in Hindi was such that he could publicly proclaim that he was an RSS devotee and wriggle out of the avalanche of criticism with ease. Mr Vajpayee proved to be the Teflon Prime Minister who could ride out many storms even as his pauses got longer and his oratorical skills ebbed. Mr Advani is attempting a makeover of his image. First, there was the grand launch of his political memoir, after he had been duly anointed by his party as the Prime Minister-in-waiting. It was, by all accounts, a success. Even as he shone in the spotlight, he came across as a political worker who had graduated to a leadership role by dint of hard work and commitment. In interviews, Mr Advani spoke about the difficult moments in his life. His praise of Pakistan’s founder Jinnah, which had created a firestorm and had cost him the party’s presidency. And before his 80th birthday, he had practically packed his bags — satisfied that he had done his bit for the party and the country —before duty called him. And the good party worker he was, he was ready to answer the call. The Karnataka assembly campaign was a logical background for Mr Advani to try to further his cause in converting his aspiration to be Prime Minister into reality. The National Democratic Alliance grouping has already accepted Mr Advani although the future shape of the NDA is far from clear, with some constituents more interested in a Third Front with the Left; others are casting around for richer pickings. These are early days yet in the leadership stakes for the next Parliament, but Mr Advani feels it is not too early for him to project his new persona. Mr Advani’s handicap is that he does not have his mentor’s felicity with words. He tends to be more direct, and honest, in what he says. But if politics is the art of reconciling contradictions, a politician must retain sufficient ambiguity to take an escape route in the face of hostility. Take his statement on his party’s attitude to a possible outcome in Karnataka. The announcement of his preference to sit on the Opposition benches can hardly be welcomed by his party men fighting what promises to be a close election. By contrast, even if Mr Vajpayee were constrained to make a similar statement, he would have hedged his comments in so many caveats that he could reverse the meaning with ease. Mr Advani’s main difficulty, however, is that the larger public does not know the real Mr Advani. If he were a true devotee of the RSS, placing the interests of the organisation above the party and the nation, he would be unacceptable to large sections of the people. Besides, how can he possibly justify the kind of rhetoric he indulged in during the rath yatra and its tragic consequences, including the destruction of the Babri mosque, although the BJP got the votes in the end? Can ends justify means? Second, does Mr Advani accept Mr Narendra Modi’s Gujarat model of governance? Mr Vajpayee half-heartedly tried to bring Mr Modi to book for the Gujarat carnage until he was overruled by the RSS leadership. Reports suggest Mr Advani was in the ranks of Mr Modi’s supporters. Does Mr Modi now also subscribe to the Oscar Wildean adage of nothing succeeding like excess? Beyond these specific instances, what is Mr Advani’s vision for the future? Is it a version of the Hindu rashtra, with its attendant baggage, which is unacceptable to the minorities and significant sections of Hindus? It is one thing to do one’s duty by the party and the party’s mentor the RSS, quite another to govern a heterogeneous multi-ethnic, multi-religious country. By most people’s reckoning, Mr Advani still has a lot of work ahead of him to convince the people that he is the right man to lead the country, in the event of the BJP securing the largest number of seats in the next Lok Sabha. His party will, of course, issue its manifesto before the next general election, but he needs to make his own peace with the people. It cannot be on the basis of a warped view of India and the world. The country will demand a non-sectarian agenda. HAVING cleared the written examination for the IAS and Allied Services, I was to appear for the final interview at the UPSC in February, 1962. However, since we had been uprooted from Lahore during the holocaust of partition, my family could ill afford formal instruction at the few elitist coaching centres that existed those days. I thus set down to a rigorous routine of preparation for the final selection and thought of little else during the intervening period. A few days prior to the appointed time I reached Delhi and stayed with my friends, Satish and Sokhey, who shared modest paying-guest accommodation in a lane behind Janpath, then known as Queen’s Way. As is obvious, hospitality and friendship then were vitally alive. My friends seemed as involved with my interview as I was but amusingly enough, their excitement and anxiety seemed centered more on my sartorial code than on what I had to say. They were determined to send me off in a woollen suit, while I was equipped with only a combination. Sokhey had recently brought back a couple of immaculately tailored suits from Tokyo and was generous enough to offer me a pick of the two but neither would fit. Finally, a common friend Sohan Talwar’s suit fit, though a mite too loosely. Much as I still wanted to be what I was and wear what I possessed, the trio would hear none of it. So ‘the suit’ it would be. Although uncomfortable in borrowed plumes, I managed to hold my own at the interview before a formidable selection panel that had stalwarts like KPS Menon, who grilled me good and proper, A.N. Jha, K.M. Panniker, V.S.Hejmadi and T.R.Subedar with S.H. Zaheer in the Chair. To my surprise and delight I topped the IPS list despite my borrowed accoutrements. It was soon time for my departure for Mussoorie, to undergo a foundational course at the National Academy of Administration. This time, however, in his eagerness to see me outfitted “suitably”, it was my brother-in-law who insisted on the importance of my acquiring a woollen suit before joining the academy. I finally relented and we both set off to Grover Sons, Amritsar, where I picked up a modestly priced suit length. Conscious that he was to endow an IPS officer, Mr Grover, the owner, meticulously set about taking my measurements. That done he very quietly and discreetly inquired “gentleman to the left or right, sir?” I stared at him quizzical and uncomprehending, but sensing my ignorance and discomfiture he quickly ran his expert eye and hand over my anatomy and soon arrived at his own conclusion. The suit, of course, was stitched to perfection! The UN Human Rights Council member Ansar Burney has filed a petition that Sarabjit must not be hanged, as there are too many loose ends in the case. Yet, as per Islamic law, unless and until relations of the victims of the alleged bombing themselves agree to pardon the accused, the sentence will stand. A great amount of uncertainty continues to surround the entire case and no one for sure can guess what the final outcome could be. As this traumatic and excruciating situation plays out to an unbearable climax, this deferment of Sarabjit Singh’s execution provides for some time to look deeper into how expertly or otherwise the entire case has been handled, by all concerned, on this side of the border. A certain amount of confusion has arisen, either in our marshalling of the facts or in their presentation to the Pakistani authorities. In spite of all efforts, Pakistan’s highest court has already delivered its final judgement. With the media on both sides having a field day with their own pronouncements and Sarabjit’s hapless family making its periodic rounds of the Pakistani High Commission in New Delhi, it is perhaps time to sift the wheat from the chaff and answer a few questions that are relevant to the entire case. Firstly, how exactly is Sarabjit Singh been seen? Is he a villager in a drunken state who inadvertently crossed the Indo-Pak border, a spy sent on a mission and found doing what all spies do, or an Indian terrorist whose name Pakistan has linked to four bombings and the killing of 14 citizens of that country? Pakistan says he is in the last category. It is well known that in cross-border crossings in Wagah or on the Indo-Bangladesh border, smugglers do ply their trade for the love of money and profit, and many, after serving sentences in jail on either side, are eventually repatriated to their home countries. Yet Sarabjit has been languishing in jail for 17 long years. How exactly and on what terms are we Indians looking for a special dispensation in his case? Is it a case of mistaken identity, where this Sarabjit Singh is not the one named Manjit Singh whom Pakistan has sentenced, and therefore the former needs to be set free immediately? Pakistan, of course, maintains that the person they have sentenced is indeed Manjit Singh. Sarabjit’s family’s case is that he is not a spy and has strayed across by mistake. They are now pleading for his acquittal and his eventual return home. So, as per their reckoning, Sarabjit has done his jail tenure, and the question of commutation to life imprisonment does not arise. The Indian government has on its part sought pure and simple clemency, though there has been a subtle hint that his sentencing is being seen as a retaliation to the recent death in Indian custody of a Pakistani, and implying that the execution could “impinge on the positive atmosphere” between the two nations. In other words, India is asking for an act of clemency for better Indo-Pak relations. Diplomatically speaking, the Indian government has unwittingly provided leeway for Pakistan to link the repatriation of all categories of Pakistanis held prisoner in Indian jails. Pakistan could quote public opinion in their country for similar concessions to their citizens interned in our country. In Sarabjit’s case, one of the relations of one of the victims of Sarabjit’s purported bombings has already said that he could forgive Sarabjit provided India releases all Pakistani prisoners held here. There are so many prisoners on both sides interned for all kinds of offences under various acts of the law, as applicable in the two countries. Who would fall in which category for release would be a question not easy to answer. Furthermore, as per diplomatic practice and tradition, no spy who is sent out into the cold is ever owned up by the sender power for obvious reasons, and many have just perished in the Cold War years without even a trace. One is not implying that Sarabjit is a spy, but only stating the hazards involved when a person is picked up in a foreign country without the necessary papers. The implication in Sarabjit’s case is deeper in that the Pakistani government is not calling him a spy but a terrorist, who, as per their findings, has killed their citizens. The solid hope now could be for the family to produce some documents, that the Pakistanis could accept as showing that Sarabjit is not Manjit Singh. Or could the new government in Pakistan, in an act of goodwill through President Pervez Musharraf, recommend changing the sentence to that of life imprisonment? Is there any other route still left open for Sarabjit Singh? In their time, in the case of IC 814, the NDA government did return some of those that Pakistan had wanted back, for the sake of Indians traveling on the hijacked flight. Is the UPA government prepared to exchange a few select prisoners with Pakistan for Sarabjit’s sake? If not, then the only option left is to request the Pakistani President for unconditional clemency from the death sentence, through a due process of law, assisted by a team of qualified, full time attorneys, which Sarabjit Singh’s family does not appear to have at present. Can someone help in this regard? Burney can only do so much and unfortunately Kashmir Singh, who was recently repatriated to India, has not done any good to Sarabjit’s case by giving interviews about the role he played while in Pakistan before his arrest. Could professional and timely intervention by the fraternity of top Indian lawyers through the Ministry of External Affairs have produced better results, is the nagging question that does not seem to have an answer. The following day, with much less ceremony and more dispatch, his popular and powerful predecessor, Vladimir Putin, will almost certainly become Russia’s new prime minister. Putin will move upriver from the Kremlin to Russia’s White House, home to prime ministers, who traditionally have functioned as political errand boys for the president. Since the moment last year when Putin announced his willingness to become prime minister, Russia has been gripped by questions: Who will rule Russia? Why is Putin assuming a seemingly subordinate role to Medvedev? And how long will this tango last? Neither Putin nor Medvedev has publicly discussed the division of powers in any detail except to say they are in complete harmony about the country’s direction. The two men, who have worked together for nearly two decades, with Putin as boss, have a close personal relationship. But Russian history shows that the man in the Kremlin almost always begins to savor and exercise his authority. Medvedev, 42, is assuming an office that according to the Russian constitution is the most powerful in the land, carrying the right to dismiss the prime minister. Under Putin, the presidential administration became the country’s unchallenged center of power, dominating parliament and the courts, reining in the media, and making leaders in the country’s sprawling regions subject to appointment by Moscow. But Putin, 55, leaves office with enormous political capital and new institutional prerogatives that at the very least will make him the most powerful prime minister the country has ever seen. Since Medvedev was elected, Putin has also been named chairman of the dominant United Russia party, beginning on Thursday. The party rewrote its rules to allow its new chairman to dismiss any functionary and suspend any party activity. Through the party, Putin will control both houses of parliament, which can impeach the president and regional governors. He will also be master of Russia’s vast bureaucracy and state-controlled companies whose ranks are full of his loyalists. What remains uncertain is how Putin intends to exercise this power, and to what end. Is he simply biding his time before returning to the Kremlin as president, consolidating his new position so as to rule out the unlikely possibility that Medvedev might warm to the presidency and turn against him? Or has he been careful to maintain so much power in order to protect Medvedev while the neophyte president establishes his own base in a system that would devour him without Putin’s oversight? Or is there no grand strategy, and the two men, while agreeing to share power, have not looked beyond the horizon? But Sergey Markov, a United Russia lawmaker and political analyst, said that if Medvedev proves up to the job and broadly follows the policies set by Putin, then the former president will leave the stage in a year or two. Although rising prices of essential commodities has kept finance minister P. Chidambaram on his toes, the minister still managed to take time off to watch the IPL match held in the Capital last week. Clearly relaxed after the completion of all financial business in Parliament, Chidambaram wanted a break and requested Rajya Sabha MP and BCCI office bearer Rajiv Shukla to make the necessary arrangements. Shukla, in turn, put in a word with BJP MP Arun Jaitley, who has a special box at the Ferozshah Kotla stadium in his capacity as president of the Delhi and District Cricket Association (DDCA). Jaitley was only too happy to organise a seat for the finance minister. Apparently, Chidambaram was so keen to get away from work that he even skipped an important meetng on the Karnataka election campaign, organised at AICC general secretary Prithviraj Chavan’s residence that evening. Janata Dal (U) leaders Sharad Yadav and Nitish Kumar have been extremely unhappy with the BJP, who, they said, had violated the coalition dharma by poaching on their candidates in Karnataka. Apparently, the JD (U) wanted to field Anil Hegde, former defence minister George Fernandes’s right hand man, in the Karnataka assembly polls on their party ticket. Hegde, however, had other plans. He told the BJP leaders that he did not wish to contest as a JD (U) candidate and would much rather fight on a BJP ticket. While both Nitish Kumar and Sharad Yadav have been crying foul since this incident, BJP leaders maintain it’s not their fault that their own candidate has deserted them. Shipping and Transport Minister T.R. Baalu seems to have taken on the responsibility of keeping the UPA coalition in controversy, from his southern state partner Anbumani Ramadoss. He was in the eye of a storm for using his official position for allocation of gas for his son’s company. He then got flak from the Public Accounts Committee of Parliament for interfering in the working of a Port Trust. The controversial DMK minister is again in the news, this time for not letting the CBI carry out investigations into reported corruption in the functioning of the Kandla Port Trust under his ministry. He is also learnt to have removed the official who drew attention to the corruption. Clearly, Baalu is a law unto himself as it was the Central Vigilance Commission which had recommended a CBI inquiry.